NEW YORK, Jan 31 2019 (IPS) - Since announcing his candidacy in the 2016 presidential elections to the end of his second year in office, U.S. President Donald Trump has sent 1,339 tweets about the media that were critical, insinuating, condemning, or threatening. In lieu of formal appearances as president, Trump has tweeted over 5,400 times to his more than 55.8 million followers; over 11 percent of these insulted or criticized journalists and outlets, or condemned and denigrated the news media as a whole. To better monitor this negative rhetoric, CPJ’s North America program created a database to track tweets in which Trump mentioned the media, individual journalists, news outlets, or journalistic sources in a negative tone. The president’s tweets can have an impact and consequences for the press both at home and abroad. His rhetoric has given cover to autocratic regimes: world leaders from Cambodia to the Philippines have echoed terms like “fake news” in the midst of crackdowns on press freedom. And the rhetoric has sometimes resulted in harassment of individual journalists in the U.S., where CPJ is aware of several journalists who say they were harassed or threatened online after being singled out on Twitter by Trump. CPJ’s database of tweets can be viewed here and our methodology can be found here. CPJ found that the focus of the tweets has shifted dramatically. 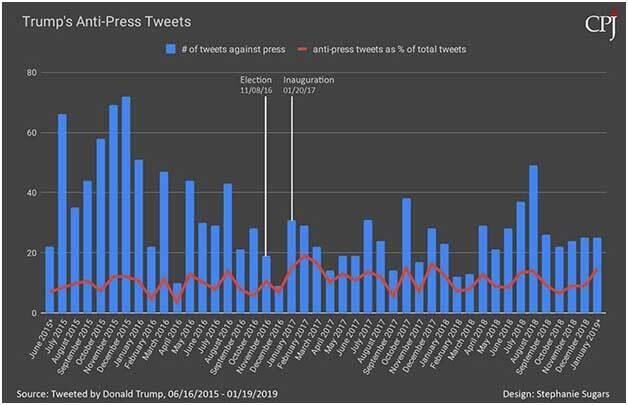 During the campaign, Trump frequently called out specific journalists by name or Twitter handle, accounting for over a third of his negative tweets about the press during that period. This trend declined in the months leading up to the election and, since taking office, his focus shifted instead to the media as a whole, accounting for 63 percent of his tweets about the press in the first two years of his presidency, compared with 23 percent as a candidate. The overall number and rate of Trump’s tweeting has also decreased since he took office. However, those targeted at the press constitute a larger percentage of his total tweets during his presidency. The term “fake news” did not appear in Trump’s tweets until after he was elected. It was used for the first time in December 2016. It came into more frequent use in January 2017, in reference first to leaked reports on Russian hacking and then to reports on his inauguration and approval ratings. •	January 2017 (15 percent): In response to reports on the Intelligence Community Assessment’s confirmation of Russian hacking. •	February 2017 (19 percent): In response to reports about his election win, emerging news about Russian hacking, and leakers. •	March 2017 (17 percent): In response to reports about infighting within the Trump administration, the leak of part of his tax returns, and Russian hacking. •	October 2017 (15 percent): In response to reports on hurricane relief in Puerto Rico, Rex Tillerson allegedly threatening to resign, and a perceived lack of positive economic coverage. •	December 2017 (16 percent): In response to focusing on reporting on collusion with Russia, the Republican tax reform, and reviews of Trump’s first year in office). Trump insulted individual journalists via Twitter 280 times as a candidate. CPJ has documented cases of several journalists who said after being targeted by him on Twitter they were harassed or doxxed. During the first two years of his presidency, Trump has cited specific journalists 48 times. Notable exceptions to this sharp decline took place in January and September 2018, when Trump tweeted about Michael Wolff and Bob Woodward when their books on the president and his administration were released. The database showed that the outlets targeted the most–either directly or through tweets about their journalists–were the New York Times and CNN, with Fox News coming in third. During the Republican primaries, Fox was a frequent target, cited in 148 tweets. Of these, Fox broadcaster Megyn Kelly was the primary target in nearly half, cited in 64 tweets, after the first Republican presidential debate in 2016, where she questioned Trump about the derogatory language he uses against women. In the weeks following the debate, Trump tweeted negative comments about Kelly, including insulting her both personally and professionally. Trump also targeted other conservative-leaning outlets during this period, including The Blaze, The Weekly Standard, RedState, and the National Review. Trump has also used Twitter to accuse the press of falsifying anonymous sources. Trump tweeted about “phony,” “nonexistent,” or “made up” sources on five occasions during his candidacy, all of which were posted in the three months between winning the Republican primary and the election. The moniker “enemy of the people” appeared in only four tweets during his first year in office. In his second year, the number was 21, nearly all after Annapolis.